What if Stan Van Gundy Chose Promise Over Power? 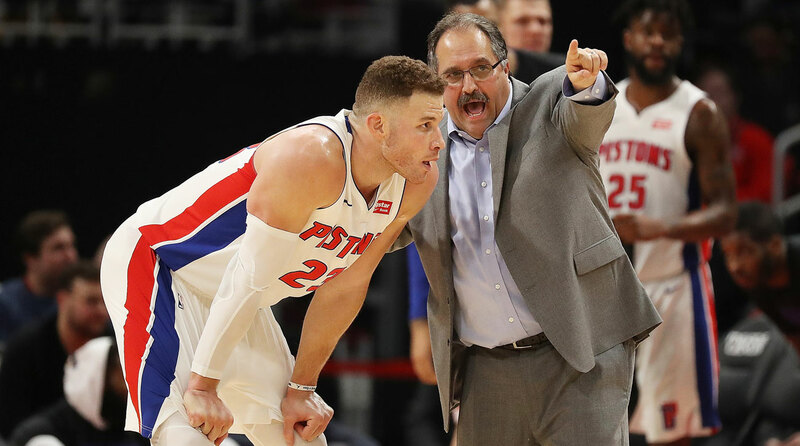 A few years ago, Stan Van Gundy was a front-runner for the Warriors head coach opening but opted for more control with the Pistons. The decision will go down as one of the NBA's greatest what-if scenarios. Stan Van Gundy could be coaching the Warriors right now. This is one of the great what-ifs of modern NBA history, a domino that was about to fall but didn’t. Four years ago, Van Gundy was the favorite for the Warriors job when he pulled out of the running. He went to Detroit for full control. Steve Kerr went to Golden State to play with the best toys in the basketball world. The beauty of this what-if is that it only involves one domino: If Van Gundy had desperately wanted the Warriors job, he probably would have gotten it, and he would have coached a team ready for title contention. Imagine the last four years: Van Gundy winning championships in the Bay, and endearing himself to Northern California with his anti-Trump views; Kerr working for his old coach, Phil Jackson, with the Knicks, trying to remain likeable with an unlikeable franchise; and Pat Riley having to watch LeBron James and Stan Van Gundy battle in the NBA Finals every year. Instead, Van Gundy took the Pistons job, and Monday he ended up where he always ends up: fired, with his reputation as a terrific pure coach intact. The Pistons made the playoffs once in Van Gundy’s four years—in 2016, when they were a first round hors d’oeuvre for LeBron. There are, I think, two takeaways from his failure. 1. Most people in power in the NBA have three-decision jobs. What I mean is: If you make three great decisions, you can succeed; if you botch them, you’re finished. This isn’t the NFL, with 53 roster spots. Three decisions won’t win a championship, but they give you a chance. Van Gundy didn’t have a first-round pick his first year; it was traded before he showed up. He used the eighth pick in 2015 on Stanley Johnson instead of Devin Booker. He used the 12th pick last year on Luke Kennard instead of Donovan Mitchell. That last one will haunt the Pistons for, oh, 15 years or so. So those are two botched decisions. 2. Van Gundy should be coaching, and only coaching. Shortly after Van Gundy was hired, I chatted with him about how he wanted to build the organization. It became clear to me, in that conversation, that his view of his past did not match with everything I had heard from other people over the years. He lost his team at Wisconsin; he blamed boosters and outside influences. He said he left a title contender in Miami because of a personal decision; it was clear at the time that Heat star Shaquille O’Neal preferred to play for Riley. Van Gundy blamed his Orlando failure on CEO Alex Martins; he wasn’t necessarily wrong about that, but Van Gundy’s failure to build a relationship with Dwight Howard was as much to blame. He chose the people. Van Gundy saw a potential star in Reggie Jackson, so he traded for him and signed him to a maximum contract. He chose his general manager, Jeff Bower. Bower instituted an unusual system in which four pro scouts would watch and document every NBA game. The front office grew exponentially under Van Gundy. Owner Tom Gores approved it. Van Gundy had a chance to build what he wanted to build. And in the end … well, you can watch all those games, work all those hours, and take care of all those details. You only succeed if you nail those three big decisions. You can’t necessarily see them coming, either—if Mitchell was such a clear star, he would have gone in the top five last summer. There may be whispers in the coming days about who really wanted Griffin, or how Van Gundy felt about Mitchell. They mean nothing. He was in charge. It takes something beyond the small details to win in the NBA. You need the charisma of an individual or the sizzle of a city to attract free agents. Or you need somebody with exceptional vision to nail those three big decisions. It is clear as ever: That is not Van Gundy. All Van Gundy proved in four years is that he is just a really good coach. That’s it. He went to Detroit because he wanted to succeed or fail on his own merits. And he did.